When Manchester City met Chelsea at Stamford bridge in the last round of premier league games, it seemed like this could be the game where Guardiola’s side finally slip up and allow Manchester United to burst ahead of them in the table. Chelsea themselves, were also looking like potential contenders for the title having beaten Tottenham at Wembley and not lost since the first game of the season, at home to Burnley. Conte went for a familiar 3-5-2, with Hazard playing off Morata up front and Fabregas and Kante either side of Bakayoko in a midfield three. Azpelicueta and Alonso were the wingbacks, whilst with Luiz suspended; it was Rudiger, Christensen and Cahill in the back three. City lined up in a 4-3-3, with Stones and Otamendi as the center backs, Walker and Delph as full backs, Fernandinho sitting in a deep lying midfield position, with Silva and De Bruyne playing ahead of him. Sane and Sterling were the wide forwards with Gabriel Jesus as the lone striker. From the start it was clear that Conte aimed to use Kante (7) and Fabregas (4) to sit tight to David Silva (10) and Kevin De Bruyne (8). Bakayoko would sit in the centre as the third center midfielder. However Guardiola used an unusual approach. Instead of going with the conventional high full backs, he instead deployed inverted full backs. 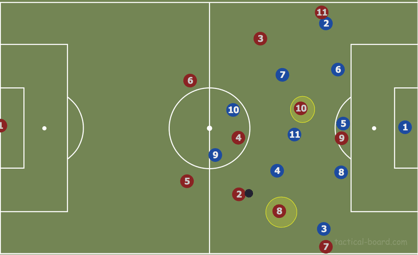 Walker and Delph, as seen in the image, sat narrow whilst Sane and Sterling pushed up high and wide to push back Azpelicueta and Alonso, forcing Chelsea into a flat five at the back. The result of this was that it left Fabregas, Kante and Bakayoko in a flat three in midfield against City’s five including their inverted wing backs. De Bruyne (8) often in the first half pulled out to the right hand side to exploit the space vacated as Alonso was pushed back into a conventional full back position. David Silva (10) played much higher than De Bruyne, almost as an orthodox number 10. He didn’t remain on the left instead he floated in the space between Kante and Bakayoko and Fabregas and Bakayoko. With Delph and Walker playing narrow, this made it impossible for Kante and Fabregas to cover De Bruyne and Silva all the time when City had position. Ideally what Conte should have done was switched to a 5-4-1 by pulling Hazard over to the left and pushing Fabregas onto the right. This way a narrow four in midfield would have been able to plug the wholes that De Bruyne and Silva were finding when playing with the flat three in midfield. In the second half, with Morata now off the field, Conte opted to use Hazard as a lone striker and play a four in midfield with Bakayoko on the left. Whilst Chelsea managed to stop De Bruyne and Silva finding space in the half spaces from Man City’s methodical possession phases due to the narrow four in midfield, Chelsea struggled on the counter attack. This was largely due to a lack of physical presence upfront, as well as a lack of support. At times, only Willian was able to support Hazard, which largely resulted in Chelsea being unable to sustain attacks, thus this allowed City to sustain pressure through possession in Chelsea’s half. City’s best chances came in the transition phase, where they won the ball back from Chelsea high up the pitch, leaving Bakayoko and Willian forward and Kante and Fabregas left to cover the width of the pitch. As seen in the image just before Kevin De Bruyne’s goal, both Silva and De Bruyne are positioned high up the pitch, almost as wide number tens. City had just regained position, therefore Bakayoko was caught up the pitch and Chelsea were not able to regain their narrow structure. De Bruyne fills the gap between Bakayoko and Fabregas, which is where the goal is created. After City’s goal it was always going to be an uphill task for Chelsea. They attempted to press high with Fabregas pushing up on Fernandinho, Pedro and Willian pushing up to the inverted full backs. Guardiola, recognising this, sent on Bernardo Silva for David Silva in order to use Bernardo’s pace to transition quickly through Chelsea’s midfield. From here on Chelsea had a limited amount of time and were unable to get back into the game. So where did Conte fail and Guardiola succeed? Guardiola’s use of inverted wingbacks was perfect in this game. He recognised that in order to dominate Chelsea he had to force them into a back five through Sane and Sterling playing high as wide forwards. This in turn creating a flat three in the midfield to which Guardiola used Delph and Walker as the inverted wing backs, which freed De Bruyne and Silva to move ahead of their regular midfield slots, into the half spaces between the centre midfielders. Conte should have started with a 5-4-1 with a narrow midfield. This would have first stopped De Bruyne and Silva finding such vast spaces, but also would have allowed the wingers to exploit the spaces in behind the inverted full backs, especially the space behind Delph who isn’t a full back, nor does he have great recovery pace. When Conte did change the system to a 5-4-1, it was without Morata up front and with Bakayoko playing as an unorthodox left winger. This left Hazard isolated and Chelsea weren’t able to exploit the spaces either side of Stones and Otamendi, as they would have if Hazard had been used as the left winger. This game, whilst it shows the tactical genius of Guardiola, it also shows the potential problems that Chelsea will encounter this season, in being so reliant on the five at the back system. Conte may look to move to a four at the back in specific games to counter these types of tactics, but even so, Chelsea lack the defenders to play with a four, as Alonso isn’t positionally aware enough to play as a left back, nor is David Luiz capable of not playing in a three. 16 year old student. Manchester United fan, love watching European football especially La Liga and the Bundesliga.